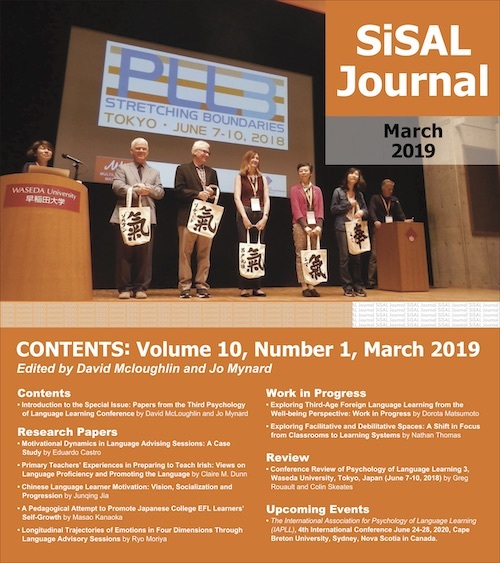 Welcome to issue 8(1) of SiSAL Journal, which is a general issue. It contains five papers and one review edited by Hisako Yamashita. The first paper is by Catherine Cheetham, Melody Elliott, Alan Harper, and Mika Ito all based at Tokai University in Japan. The authors present a study of an extensive reading (ER) programme at their institution. They discovered that providing learners with access to a mobile library is a successful way to engage them in developing autonomous reading skills. The second paper by Jessie Choi at Hong Kong Education University is a case study which illustrates several changes that have taken place at the self-access centre at the author’s institution. Drawing on design theories, the author provides a breakdown of practical changes that resulted in a drastic increase in engagement by users. The third paper is by Arabel Cristina Herrera Cerón and Atenas Leticia García who are both based at the Gámez Escuela Nacional Preparatoria 2 in Mexico City. The authors provide a reflective account of the need to create links between the self-access centre and classrooms in secondary and high school contexts in Mexico. Teachers play a crucial role in helping learners to understand the importance of developing autonomous learning skills and utilising the self-access centre effectively and this can be facilitated with close links between the classroom and the centre. In the fourth paper, Alexander Worth, Dani Fischer, Erik Fritz, and Ashley R. Moore based at universities in Osaka in Japan make a case for providing structured speaking activities for self-access learners. The authors provide a summary of a self-access Speaking Program at Osaka Institute of Technology and describe the rationale, how the programme was set up, and how the materials were used and revised. Initial data suggests the programme has had an instrumental role in increasing users to the self-access centre. Finally, Jing Wu based at Fudan Univrersity in Shanghai, China explores a CALL-based self-directed vocabulary programme. The author presents results of a study which compared attitudes and strategy use of sixty-one freshman students. The participants were randomly assigned to use either traditional vocabulary materials or a newly-developed CALL-based system. The results indicate key difference between the two groups. The author found that the CALL-based system stimulated overall strategy use in self-directed vocabulary more effectively than the traditional material did. There is one review in this issue which was edited by Hisako Yamashita, our reviews editor. Keiko Takahashi who is based at Kyoto University of Foreign Studies in Japan reviews a book published by Routledge New York in 2015: Reflective dialogue: Advising in language learning by Satoko Kato and Jo Mynard. The review provides an overview of each section of the book and comments on its practical nature. We are calling for interest from colleagues who would be willing to guest edit a new multilingual column of SiSAL Journal in a language other than English. We would like to provide a platform for recognising and featuring valuable contributions being made by colleagues working with languages other than English. The new column will be coordinated by Chief Column Editor Katherine Thornton. Please refer to the details on the website https://sisaljournal.org/for-authors/guesteditors/. The Japan Association on Self-Access Learning (JASAL) Annual Conference 2017 will be held at Kanda University of International Studies in Chiba Japan on 16th December. Details will follow via the JASAL website https://jasalorg.com/. I am grateful to members of the review and editorial boards for their help with producing this issue and to the authors for choosing to publish with us. Jo Mynard is the founding editor of SiSAL Journal. She is an associate professor and the Director of the Self-Access Learning Centre at Kanda University of International Studies in Japan. She holds an M.Phil. in Applied Linguistics from Trinity College, Dublin and an Ed.D. in TEFL from the University of Exeter in the UK. She has been involved in facilitating self-access language learning since 1996.